The next generation in specialty cooling systems. The SC Series embodies the latest and greatest system design tech¬nologies in an all-new housing design. Developed upon feedback directly from customers and installers, the unit incorporates a variety of high end componentry at an affordable price point. 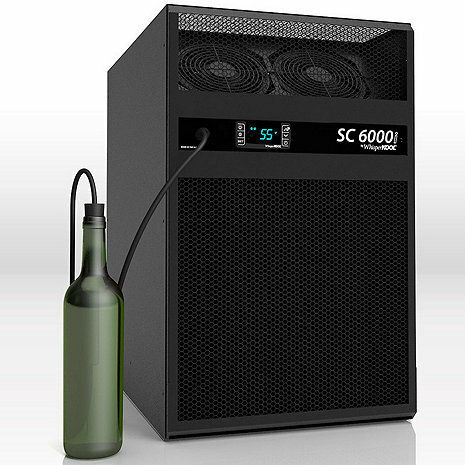 The SC Series is a direct replacement for one of the most well known cellar cooling units, the XLT. Just like the series it replaces, the units come in 5 models that effectively cool a 350 to 2000 cu. ft. properly insulated environment. Designed for simple through-the-wall installation, the unit fits between standard wall studs and a single piece mounting bracket eliminates the need for a support shelf. The SC has a 30°F temperature differential. In order to keep your cellar at 55°F, the area the unit exhausts into should not exceed 85°F. This makes interior installation ideal for SC series units. Mounts easily through your wine cellar wall and vents to an adjacent room. Venting space must be as big or larger than you wine cellar. Your cellar must be properly insulated and vapor sealed for the unit to cool properly. Can the thru wall units mount on an exterior wall ? BEST ANSWER: Thank you for your question, this unit is not made to be mounted thru an exterior wall to the outside environment. This needs to vent to interior space of equal or larger size than the wine room. Whisperkool does offer their Extreme Series which can vent to an exterior area. This unit is not made to be mounted thru an exterior wall to the outside environment. best to exhaust in a gararage or crawl/ basement. I would think you could but I would check with the manufacturer as to how the outdoor weather conditions make affect the unit. No, they are rear - venting and need to vent into a space that's at least as large as the space that the unit is cooling. Probably but based on your rnvironment I don't think you want it exposed to the elements, I wouldn't. I had mine mounted through a portal in the wallboard. Where do you find a wine storage specialist? BEST ANSWER: The folks at Wine Enthusiast can likely answer any questions you have about wine storage. I don't know what you mean by the question. I called the Wine Enthusiast people and they helped me build my wine cellar. Take an empty room. Take it down to the studs. Insulate it very well. Wrap the entire room in thick plastic sheeting. Put up green board drywall which is what you'd use in a bathroom environment. Buy the appropriate cooling unit from Wine Enthusiast. Buy wine racks. I sourced my racks from a place in Oregon who had much better eviews of there racks than WE had. Store your wine. I decorated and put table and chairs and music in there also but that was a personal choice. Good luck! do you want to buil a cellar? There are several reputable firms that do this! Is this unit quieter than the NFinity 4200? I am worried that the NFinity is too loud. My friend has one and I was struck by the lodness . . .
BEST ANSWER: Hi Ken, Actually the WhisperKool and N'FINITY Units run at around the same decibel level with the WhisperKool being just a big quieter. However, if your friend's unit is that loud it sounds like there may be an issue with how it was installed or something that may need to be adjusted on the unit. I would have your friend call the manufacturer directly to troubleshoot as neither of these units should be terribly loud. Thanks! First, our wine is at the perfect temperature. We have a wine library room with fully insulated and moisture protected walls, floor and ceiling and a single glass wall and door. Every bottle in the room (525 capacity) is beautifully cool and perfectly protected. BUT, it's really LOUD. REALLY LOUD. We left as much of the unit as we could on the outside, but it's still loud. It runs about twice an hour for 7-10 minutes each time. We love it's efficiency, think the bottle temp probe is really cool (pun intended), but hate the noise. Don't be fooled by the name, it's not a whisper.